As a child this was one of my favourite tea time meals. My Mum would always grate some cheese on top and then a splash of ketchup on top of that! Lovely! 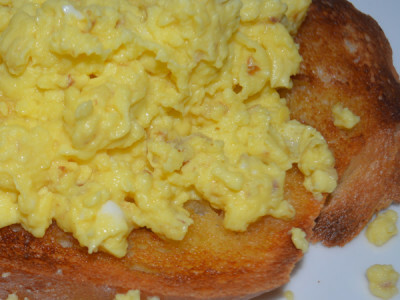 My boys also love scrambled eggs, but they like the egg well cooked, so does my wife, so naturally if I scramble eggs just for myself, I like to slow cook them and have them a bit more creamy and runny! Funnily enough scrambled eggs are also popular in India. I never tried them but I did have a good laugh about the different spellings they used on menus. I saw the normal scrambled egg, then scrabbled egg, scrumbled egg, scruppled egg, scrumpled egg and even scribbled egg! Anyway, this is my version of a lovely slow cooked scrambled egg on toast! Put the bread in the toaster and the knob of butter in a pan. Let the butter melt, then crack the eggs in a bowl and give a quick stir with a fork. Season with the salt and pepper and pour into the pan of melted butter. Reduced the heat and slowly cook the eggs stirring them so the egg is not too lumpy. When the toast is ready, butter it and place on a plate, when the egg is nice and creamy looking but cooked through, pour over the toast and enjoy!